Ground coffee consists of roughly 72% cellulose bean fiber, and 28% soluble material that can be extracted with water. The optimum extraction of this soluble material is the art and science of brewing coffee. The chart above was developed by the Specialty Coffee Association of America (SCAA). The X-axis of this chart shows the weight percentage of solubles that are extracted from the coffee grounds during the brewing process. 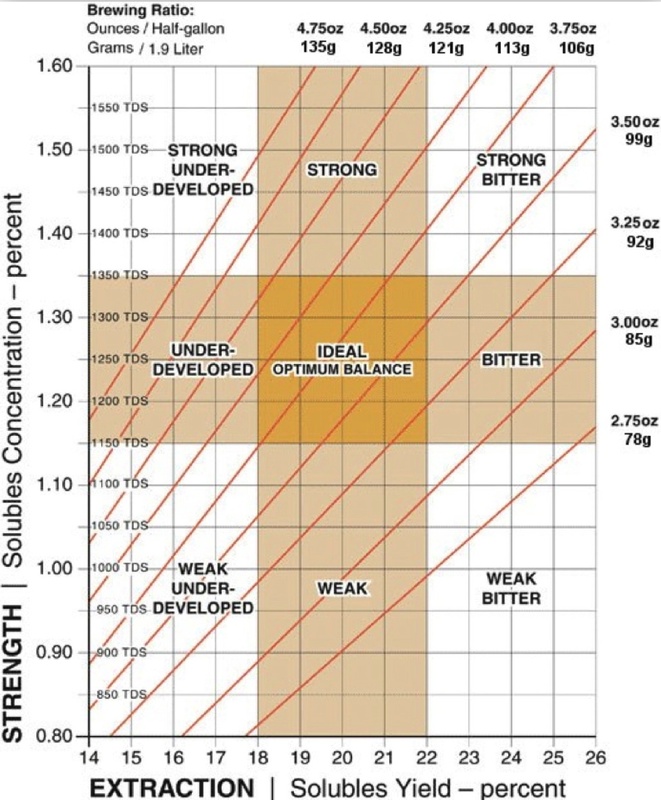 The Y-axis shows the weight percent of dissolved solids in the brewed coffee. The sloping red lines are for different ratios of water to coffee at the start of the brewing process. We will define brewing ratio as the weight of water/weight of coffee. This brewing ratio is shown with red numbers on the chart. At the boiling point of water, one fluid ounce weighs one ounce. Look at the fourth red line from the left (marked with a red arrow). It is for the brewing ratio of 16. The Cowboy Joe uses the direct immersion process; all of the coffee grounds are mixed with all of the boiling water at the start of the process. Therefore, as the brewing process takes place, the composition of the coffee follows this line, marked with the red arrow, from the lower left to the upper right. As you can see, the brewed coffee passes through five stages: weak under developed, under developed, ideal, strong, and finally, strong and bitter. For example, let’s start with 8 ounces of boiling water, and ½ ounce of ground coffee for the brewing ratio of 16. This line passes exactly through an extraction of 19% and a dissolved solids of 1.3%. We will use this point for our calculation. The amount extracted from the grounds will be 0.5oz x 19% = 0.095 oz. This 0.095 oz of dissolved solids is 1.3% of the coffee in your cup. Therefore, the amount of coffee in your cup is 0.095/0.013 = 7.3 ounces. Therefore 8 ounces boiling water gives 7.3 ounces of coffee in your cup, with 0.7 ounces of water retained by the grounds. A tasting study done back in the 50s showed that the average American preferred coffee that is within the range of the orange square at the center of the chart. So, what does that mean for us? We are unable to measure the quantities on the X and Y axis, but we can use a brewing ratio that, with proper brewing time, will put us within the orange square. The chart does not tell us the time it takes for the brewing. You must determine this by taste. You really don’t have to understand any of the above. Just pick a brewing ratio in the range of 16 to 18, and try different brewing times, such as 2,3 and 4 minutes, and see what you like the best. The coffee takes about 30 seconds to drain through the filter; this draining time should be included in the brewing time. Stirring during the brewing will shorten the time required for a given extraction. We will do a study on the effect of stirring in the future. If you follow the Cowboy Joe instructions, and weigh out 3 nickels weight of coffee (15 gms = 0.53 oz) and 9 ounces of boiling water, you will have a brewing ratio of about 17, which is a good start. You will end up with about 8 ounces of coffee in your cup.